Jalen Hurts #2 of the Alabama Crimson Tide reacts after defeating the Georgia Bulldogs 35-28 in the 2018 SEC Championship Game at Mercedes-Benz Stadium on December 1, 2018, in Atlanta, Georgia. "I’ve decided to take my talents to the University of Oklahoma," said former Alabama quarterback Jalen Hurts. 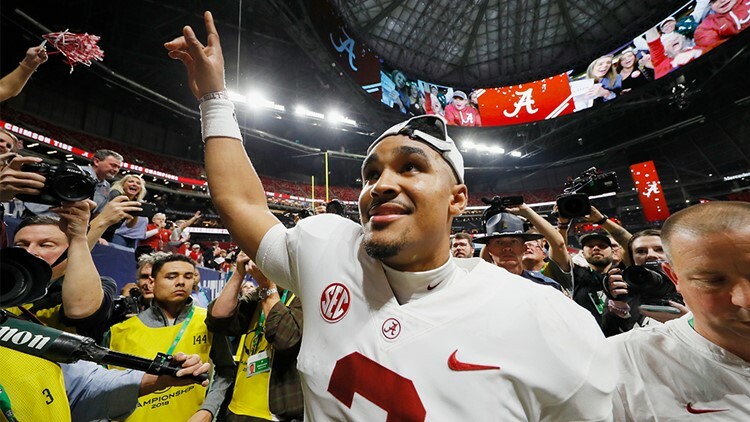 AUSTIN, Texas — Jalen Hurts announced Wednesday that he will be transferring from Alabama to the University of Oklahoma. OU now has a chance to claim three consecutive Heisman Trophy winners. Baker Mayfield in 2017, Kyler Murray in 2018 and now Jalen Hurts has an opportunity to complete the trifecta. The Channelview, Texas, native revealed his decision on The Players' Tribune. "I’ve decided to take my talents to the University of Oklahoma, where I will continue my development as both a quarterback and as a student," said Hurts in The Players' Tribune. Hurts led Alabama to a national championship in 2016, but lost his job as the Crimson Tide's starting quarterback to current Alabama quarterback, Tua Tagovailoa. Hurts, who had a 26-2 record as the Nick Saban's starting quarterback, handled the benching with class as Tagovailoa led Alabama to the national championship game against Clemson this season, a game the Crimson Tide lost. Last week, Hurts visited the University of Miami (FL) and Maryland with plans to become a graduate transfer, including Oklahoma. "I have graduated from the University of Alabama with my bachelor’s degree in public relations — and I couldn’t be prouder. This accomplishment means so much to me," wrote Hurts.